A specific application must be submitted to the Alumni office. Priority is given to children/grandchildren of MSU alumni, faculty and/or staff (former and present) in addition to academic performance. Student must be enrolled as full-time student at MSU. Selection for all scholarships is by a specific group of alumni board members from the application forms received by the deadline (see link below). 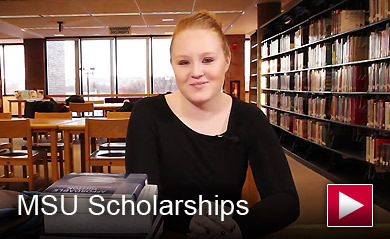 Scholarships are awarded in spring each year for the following year's expenses, one-half each semester. Scholarship winners are asked to appear at the GALA fundraising event. February 16, 2019 deadline to apply.